Gimbal applications are one of the preferred methods to stabilize systems in less-than-ideal conditions. And they are one of the most exciting and growing uses for Silverthin Thin-Section Bearings. Gimbal applications typically have a wide range of considerations that require significant engineering scrutiny, often resulting in a customized bearing solution. In many cases the bearings are required to have a maximum torque value to ensure that the entire system performs within the total torque budget of the application. There are stiffness and deflection considerations to meet performance expectations. Many of these considerations are severely impacted by use in a wide temperature range such as -40°F to +185°F. Additionally, the use of bearing mating components made from materials with vastly differing mechanical properties further complicates the performance requirements. For example, a 440C stainless steel bearing ring has a Coefficient of Thermal Expansion (CTE) of 5.6E-6 in/in/°F. 6061-T6 aluminum shafts and housings have a CTE of 12.4E-6 in/in/°F. Using a 6" diameter, at the cold temperature of -40°F the stainless ring contracts 0.0037" and the aluminum ring contracts 0.0082". For the same size at the hot temperature of +185°F, the stainless ring expands 0.0039" and the aluminum ring expands 0.0086". Figure 1 below illustrates these great differences in material performance versus temperature. 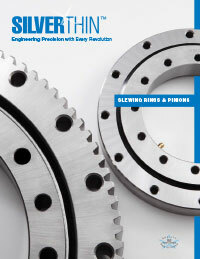 Silverthin Bearing supports the growing need for advanced and properly specified gimbal bearings. Unlike some of the SKU driven product resellers, Silverthin has decades of experience manufacturing and specifying specialty bearings; as the needs of the application have become more precise, so do the considerations of the bearing solutions. Silverthin has the application and manufacturing experience to specify, build and deliver the right product for your application. Silverthin has the Engineering Experience and Analytical Tools to review all of your performance considerations for your gimbal related application. Below, Figure's 2 and 3 show just a small sample of the types of analysis we can quickly provide to maximize the performance of your application. Figure 2: Impact of Upper Shaft Tolerance (at assembly, 68°F) on Maximum Contact Stress and resulting Diametral Clearance at +185°F (0.0000" prior to assembly, 68°F). Figure 3: Impact of Upper Shaft Tolerance (at assembly, 68°F) on Starting Torque and Radial Stiffness at +185°F. 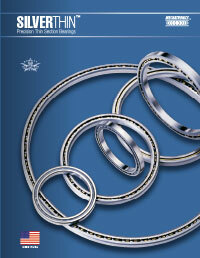 Silverthin Bearing supports the growing need for advanced and properly specified gimbal bearings. With decades of experience manufacturing and specifying specialty bearings; as the needs of the application have become more precise, so do the considerations of the bearing solutions. Silverthin has the application and manufacturing experience to specify, build and deliver the right product for your application. Following detailed review of the application requirements, Silverthin engineers will review the solution options that will best meet the operating parameters of the application. Silverthin offers a wide range of high quality, USA manufactured DFAR compliant Thin-Section bearings. Silverthin engineered products are specified for a wide range of applications. From general industrial machinery used in applications ranging from food processing equipment to robotics, medical equipment such as blood analyzers and scanners, the energy industry from solar to wind, and military and aerospace in a wide array of platforms and components. Silverthin offers not only high quality bearings and solutions, but state-of-the –art engineering services to support our products and applications.